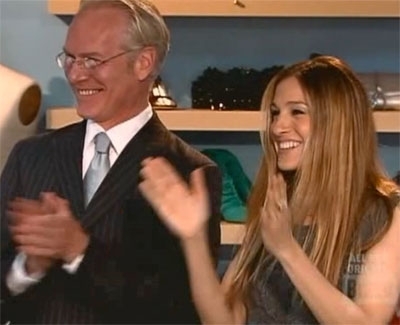 Remember Sarah Jessica Parker’s guest appearance on “Project Runway”? Well, she’s back. This time, Bravo will host SJP’s new show, “American Artist”, an art world’s version of “Project” that encompasses among other mediums, painting and sculpture. Hm…imagining a modern interpretation of the Statue of David juxtaposed with a shadow box by an edgy, nuvo Salvador Dali. Well, when wasn’t Dali edgy? But you get the idea. The possibilities are infinite (like “black-hole” infinite) especially in classifying art, let alone “good art”. This should be interesting. Designers, Project Runway is casting! Deadline: July 16th. *Oh yeah – Best Santino moment: As Tim Gunn.